When a person is diagnosed with Hashimoto’s thyroiditis, thyroid hormone replacement medication is the conventional treatment expected to cure all that ails you, but that’s far from the reality patients face all around the world. There is more to the optimal treatment of this autoimmune disease and food is an untold powerhouse for healing. Since I was diagnosed with Hashimoto’s ten years ago, I have discovered and utilized many strategies to eliminate my symptoms and eventually put my thyroid disease into remission. Of all of those strategies, the most impactful have been those that dealt with food. Removing the foods that were toxic to my body, and incorporating the ones that were healing, was life changing for me. And, I’m not alone. As I’ve worked with and heard from thousands of people with Hashimoto’s, I’ve learned that food has played the starring role in helping them to feel better too. Each case of Hashimoto’s has its own potential root cause. One person may have a food sensitivity to gluten with nutrient deficiencies in selenium and vitamin D, and may get themselves into remission by going gluten free and taking some supplements — all on their own. Another person may have multiple root causes with numerous food sensitivities, infections, toxins, nutrient depletions, stress hormone depletions, and digestive deficiencies. This person will have to keep peeling back the layers to reach symptom resolution and remission. Most of us fall somewhere in the middle with a combination of root causes. However, I’ve found that just about every person with Hashimoto’s has food sensitivities, and most people experience huge benefits from nutrition interventions. This is where food as medicine — or food pharmacology, as I like to call it — comes in! Pharmacology — the branch of medicine concerned with the study of drug action — has always been a subject that has fascinated me. How do tiny substances exert such powerful effects on our giant bodies? I mean, you can drop the blood pressure of a 200 pound person with milligrams of the right substance! You can put the same person to sleep with tiny amounts of another substance, and even cause hallucinations with micrograms of something else. Similar to the tiny substances that are found in medications, tiny substances in foods can also exert massive effects on the body, and their chemical properties can interact with our internal systems. This is what I like to call “food pharmacology.” I’m a big fan of using foods as medicine, and we can do so by acknowledging the ability that diet has to change our lives. That said, it’s important to pick the right foods and right dietary changes. Some tiny substances are food proteins that create adverse reactions in the body. The most relevant adverse reactions in Hashimoto’s are known as food sensitivities. Food sensitivities cause different types of reactions to foods than food allergies. Food allergies are immediate and often cause life-threatening reactions (think the child who stops breathing after eating nuts), and are readily acknowledged and tested for by conventional medical doctors, especially allergists. These reactions are known as Type I hypersensitivity reactions and are governed by the IgE branch of the immune system. There are also Type IV delayed hypersensitivity reactions governed by the IgG branch of the immune system. As the name implies, they do not occur right away. In fact, it can take up to four days for them to manifest, and this is one of the reasons why it’s so hard for most people to correlate food sensitivities with symptoms. For example, you may eat corn on Monday and have a panic attack on Wednesday! Here’s the connection I’ve made… Hashimoto’s is also considered a Type IV delayed hypersensitivity reaction and often presents with IgG antibodies to the thyroid gland. In my experience, whenever we eat foods that flare up our IgG system, this also seems to flare up thyroid antibodies. Additional symptoms caused by IgG-mediated food reactions include sinus conditions, gastrointestinal distress, cardiac irregularities, skin flare-ups, inflammatory pain, and cognitive dysfunction. What’s the silver lining? When you eliminate your reactive foods, you eliminate your symptoms — and often, the attack on your thyroid. While I have seen tremendous improvements through eliminating reactive foods, there is not much support for using nutrition to address Hashimoto’s within the medical system. One of the only exceptions is that most physicians will admit that there is a connection between celiac disease and Hashimoto’s. This is why most conventionally trained doctors and endocrinologists will tell you that you do not need to change your diet with Hashimoto’s, despite the real world data that shows that diet does make a difference. Our current medical system works in silos. I saw this time and time again as a consultant pharmacist — each organ was treated like it existed in a vacuum — and, oftentimes, side effects of one medication used to treat one part of the body would be recognized as a new disease in a different part of the body, without acknowledging the systemic effects. The takeaway here is that most doctors are not looking at nutrition as a factor. Therefore, they can’t comment on how effective diet is. In the end, you don’t know what you don’t know, and you can’t claim expertise on something you’ve never measured. Most doctors think that if something was that helpful they would have likely known about it. I know that I was personally shocked. How did I not learn about the benefits of diet sooner? After all, I had spent four years studying diseases and their treatment options in pharmacy school. Once I discovered how much diet could help a person heal from Hashimoto’s, I wanted to shout it from the rooftops. That’s when I published my first book detailing how helpful diet can be, and the reasons behind why this was the case. I thought for sure that a research center or an endocrinology association would try out the various methods I found to be helpful, but that never happened. However, two years later, I realized that I didn’t have to wait for a research center — I could do my own research with the help of my Root Cause Rebel community. I conducted a survey of my readers from May 10th to May 31st, 2015. In total, 2,232 people answered the survey, 1,991 of whom reported to have Hashimoto’s. Only 78 (3.5 percent) were also diagnosed with celiac disease. It should be noted that this method of conducting research has limitations by traditional research standards; it was directed at a biased group (they were all my educated readers, after all), and I did not have a control group. Nonetheless, it revealed a lot of exciting trends. If you trust people who are just like you, then you will find this information to be helpful. So, How Should I Eat With Hashimoto’s? Each person with Hashimoto’s has a unique root cause, but I’ve found that there are protocols that help most people feel better, regardless of what triggered their condition. Food is a crucial first step. Following a nutrient dense diet will always help a person with thyroid disease, but you may need to modify the diet according to your food sensitivities. I’ve discovered that the gluten free diet, the Paleo diet, and the Autoimmune Paleo Diet can all help eliminate thyroid symptoms — and in some cases, even thyroid antibodies! For some people, the gluten free diet is all that’s needed. Some need to dig slightly deeper with following the Paleo diet. Others need to dig even deeper and may find success with the Autoimmune Paleo diet. It’s a great option for people who feel like they’ve “tried it all” and still aren’t seeing improvements in their health. As I mentioned earlier, the term “food pharmacology” refers to the use of food as medicine to restore health to the body. I recommend including these foods in your diet on a regular basis to help your thyroid heal and promote whole-body healing. Bone broth provides healing collagen, proline, glycine, and glutamine, as well as several important minerals, such as calcium, magnesium, phosphorus, and sulphur, that are readily absorbed by the body in this digestible form. These healing substances act to strengthen joints, soothe and heal the gut lining, boost the immune system, and make the skin glow — to name a few key benefits. It truly is a superfood. Smoothies are a really great way to increase our intake of nutritious food without the digestive stress. As smoothies are chopped up, the food becomes easier to digest and the nutrients are easier to absorb. Green smoothies and green juices are like a shot of energy. Dense, leafy greens, such as kale, spinach and chard, are loaded with antioxidants, as well as fiber, which promote intestinal health by sweeping the intestines clean and boosting the detoxification process. I recommend adding some protein to your smoothie for a better macronutrient balance. Fermented foods are an excellent way to promote gut healing, as the probiotics, aka “good bacteria,” that are produced during the fermentation process can be beneficial in balancing your intestinal flora. They can also help with symptoms of constipation, digestion, and anxiety. Gelatin is derived from the bones and fibrous tissues of animals, and consists mostly of the amino acids glycine and proline. These amino acids are crucial not only for healthy skin, hair and nail growth, but for optimal immune function as well. Gelatin has been shown to promote joint health, deepen sleep, and improve digestion by binding with water to help move food through the digestive tract. Because the structure of lemon juice is similar to that of gastric juices, it can help support the stomach and the liver’s detoxification pathways. It’s also packed full of antioxidants, and, thanks to its acidity, hot lemon water aids in the absorption of certain medications, including thyroid hormone medications. I encourage drinking hot lemon water in the morning on an empty stomach to boost energy and aid the body in healing. Beets are a good source of phytonutrients, which perform anti-inflammatory and antioxidant duties in the body. For those with the MTHFR gene mutation, beets are especially beneficial, as they are rich in betaine, a substance that can help break down homocysteine (which, when elevated, can lead to heart disease, difficult pregnancies, birth defects, and an impaired ability to detoxify). The glucosinolates found in crucifers like cabbage, broccoli, cauliflower, kale, and turnips are what cause cruciferous vegetables to help increase detoxification in the liver, which is beneficial for individuals with autoimmune thyroid disease. Avoiding crucifers with Hashimoto’s is not necessary for most people. However, if you are concerned about the goitrogenic potential of crucifers, you can lightly steam or ferment cruciferous vegetables, since they truly only affect the thyroid’s absorption of iodine in a raw state. Fresh cilantro is a natural chelator, which means it will bind to certain toxins and help excrete them from the body. There are other natural chelators such as chlorella and spirulina, although I do not generally recommend these for people with Hashimoto’s due to their high iodine content and their potential to modify the immune system. You can add cilantro to salads, avocados, green juices, smoothies, and salsas. You can also use cilantro as a fresh condiment topper on chili and certain soups, depending on the flavor. Fiber acts like a sponge as it moves through the digestive process and helps sop up toxins and excess hormones, ultimately supporting their path to excretion. It’s best to get fiber from fruits and vegetables instead of supplemental forms, as supplements have been known to aggravate intestinal permeability and SIBO. Green juices are full of healing nutrients that are easily digestible in liquid form. They are also a wonderful source of chlorophyll, which is a green pigment found in plants, that has numerous health benefits. Chlorophyll has been shown to help support the process of detoxification in the liver, reduce inflammation and oxidative stress, raise iron levels, and even work as a natural deodorant by neutralizing odors. Curcumin, the active ingredient found in turmeric, is what’s responsible for this spice’s natural anti-inflammatory and antioxidant effects. Turmeric is also antibacterial and antiviral, effective at helping detoxify various metals and toxins, and linked to improved mood and memory. Typically, the effects of curcumin only last about an hour in the body, but I’ve found that combining curcumin with piperine, an alkaloid found in pepper, will keep it in the body longer. I recommend turmeric for Hashimoto’s because it helps support the gut, liver, and detoxification pathways. Thanks to its anti-inflammatory effect, it can be especially helpful if you are experiencing pain. Berries are a plentiful source of phytonutrients that act as antioxidants in the body. Since they are high in fiber, they don’t cause a spike in your blood sugar as other fruits tend to do. I recommend eating a variety of berries, including blackberries, blueberries, raspberries, and strawberries, as well as more exotic types such as boysenberries, currants, and gooseberries. Blueberries, in particular, are a rich source of myo-inositol, a nutrient that has been shown to improve thyroid function and blood sugar. You might be thinking, how can I add all these beneficial foods to my diet? Life is busy, and time is precious. This is why I wanted to create a solution to help people eat nutritious meals, save time and money, and not feel like they are always glued to the kitchen. I know that when I first started changing my diet, it took so much time to get the right cookbooks, do all of the research, pick recipes, make a plan, and start a list. It took hundreds of dollars and hours for me to get started — and I still did it wrong, “forgetting” to cut out soy when I first went gluten free. I want you to learn from my mistakes. In my first books, I wasn’t able to go into details on the dietary elements the way I wanted to, and I have had many questions from readers over the years on how to incorporate food pharmacology into their daily lives. They asked for specific recipes and favorite foods of mine that would make this way of eating easier for them. 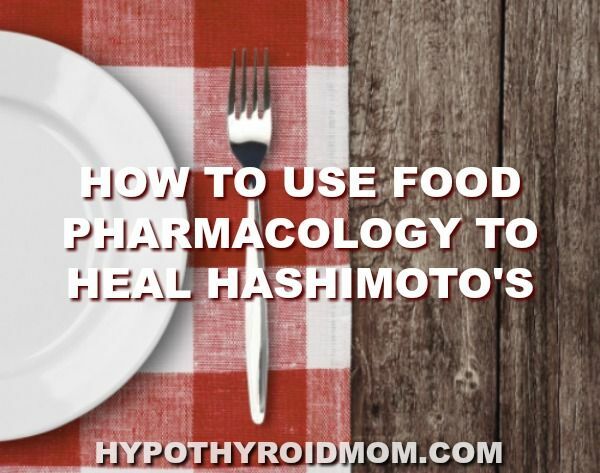 The result of all of those requests is my cookbook, Hashimoto’s Food Pharmacology: Nutrition Protocols and Healing Recipes to Take Charge of Your Thyroid Health. All the recipes remove the most harmful trigger foods and incorporate beneficial foods (like the ones I mentioned above) to help your body heal, and your thyroid thrive. Dr. Izabella Wentz is an internationally acclaimed thyroid specialist and licensed pharmacist who has dedicated her career to addressing the root causes of autoimmune thyroid disease after being diagnosed with Hashimoto’s thyroiditis in 2009. She is the two-time New York Times bestseller of Hashimoto’s Thyroiditis: Root Cause and Hashimoto’s Protocol. Fasano A, Berti I, Gerarduzzi T, et al. Prevalence of celiac disease in at-risk and not-at-risk groups in the United States: a large multicenter study. Arch Intern Med. 2003;163(3):286-292. The right and wrong foods definitely has a huge impact on Hashimoto’s disease! Going gluten free has definitely helped many patients we have talked with, similar to this Doctor’s results.